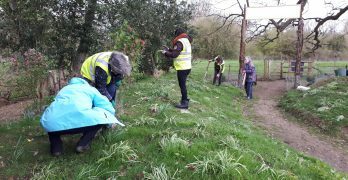 For the first time since September 2016 a small working party of volunteers returned to the Park Field to resume our traditional role of ‘scrub-bashing’, while a second work party continued to tackle recently scheduled tasks in the Fernery. We started to clear the scrub around the sequoia at the entrance to the Park Field next to the new cattle corral. 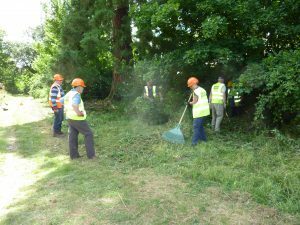 Strimmers were used to gain access to the scrub growing around the base of the sequoia, and then loppers. 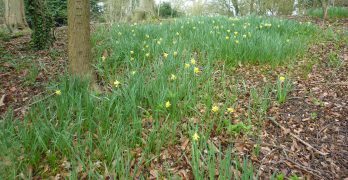 We expect that next month we will continue to clear scrub at this point, before moving further along the same path. 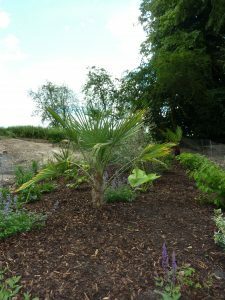 Harry led the team to install wire around the entire three-tiered May Bed which has recently been planted with geraniums, before weeding and watering all the beds. 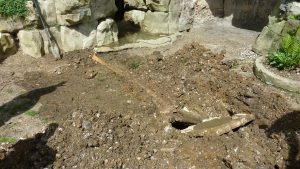 The dropping well basin was also cleaned out once again following the successful experimental fill on Open Day the previous weekend. 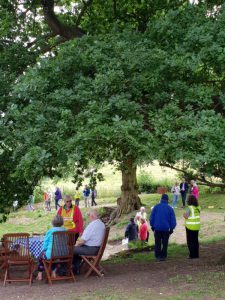 The 2018 Open Garden Day was another great success, and a reward for all the hard work that the volunteers have put in over the past 12 months. 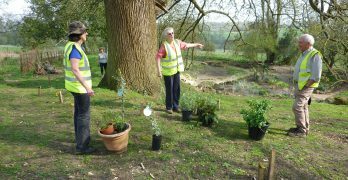 In June 2017, following the success of our first Open Day, the volunteers collectively believed that we could not merit holding another Open Garden for at least two more years because we doubted that we would have achieved sufficient change. 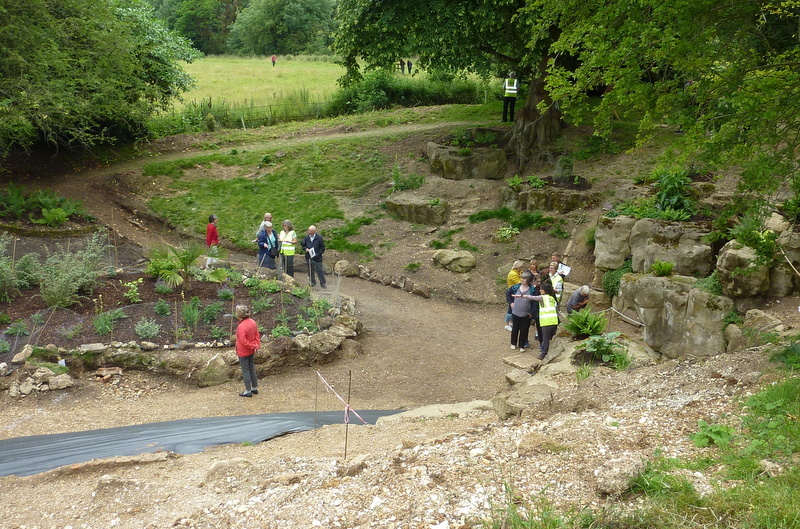 Some 200 visitors were amazed to see the progress made in the past year. As an experiment, during the course of the afternoon we ran a hosepipe from our mains feed down the face of the dropping well and into the basin and then on to the drainage sump. 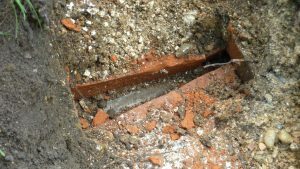 In this way we created a trickle effect which the Victorians might have similarly produced by opening a tap to let water flow from the cistern. 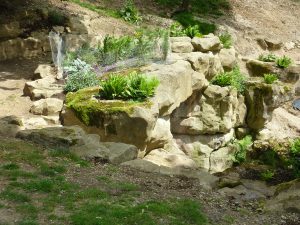 The experiment was very successful and we now seriously wonder if water would ever have been pumped around the cascade to the dropping well and then back up to the cistern. 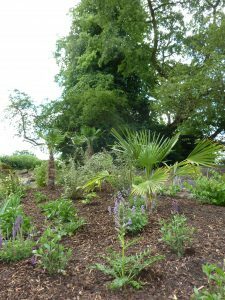 Having unearthed it, we have planted another bed, the main ‘Central Bed’, to Sarah Marsh’s wonderful design. 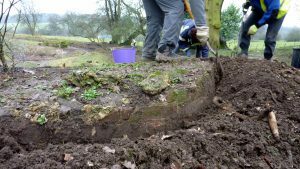 As agreed at the beginning of this Project, when the going has got tough, and the volunteers would otherwise have struggled, mechanical equipment has been brought onto the site. 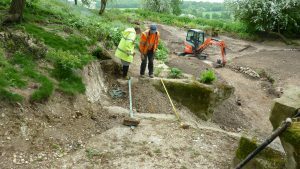 It is largely due to the skilled and careful approach by the Maydencroft operatives that so much has been uncovered. 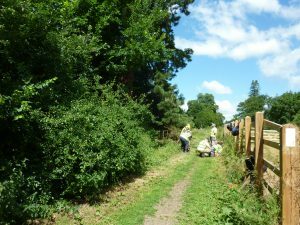 Underpinning absolutely everything has been the enthusiastic teamwork of our volunteers, some of whom regularly join us from the Sherrardspark Wood Wardens, and from the Friends of Mardley Heath. They are led by our more than capable Committee (the so-called HOD5) all of whom have put an enormous amount of personal time and commitment into this Project since it started in September 2015. 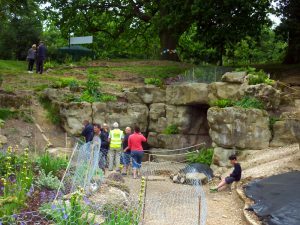 We have mentioned before that for the Months of July August and September we will cease excavation work in the Fernery and return to the Park Field to carry out some essential maintenance that we have been neglecting over the past year while we have been developing the Fernery. 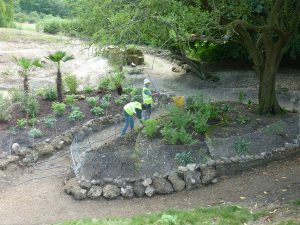 But because we have so recently completed a major cleanup of the Fernery in readiness for the Open Day, then one month earlier than forecast we are going to take the opportunity of splitting ourselves into two groups – one to continue caring for the Fernery Garden, and a second group to work in the Nature Reserve Park Field. 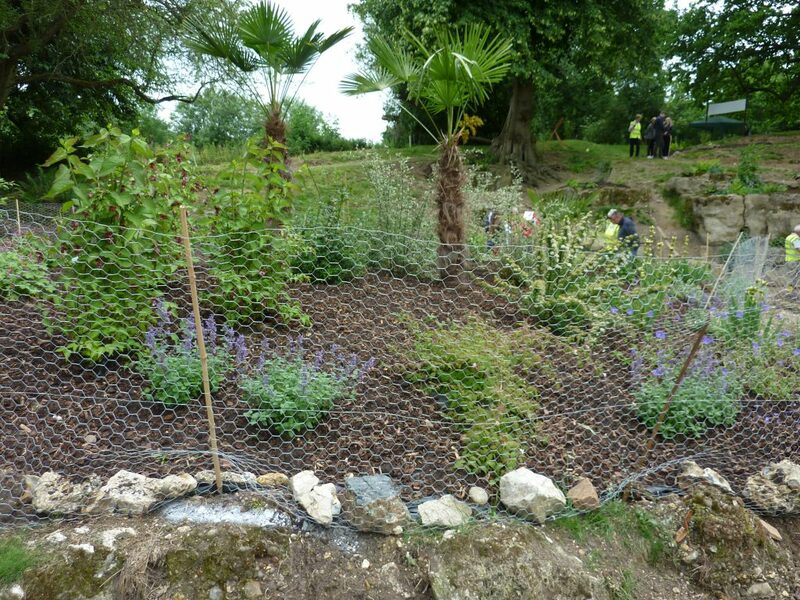 The key task for this Thursday is to fix Rabbit Wire around the entire three-terraced May Bed. This is an urgent task because rabbits love to nibble geraniums, and new ones were planted as recently as the Open Day. Sarah has purchased a new roll of wire especially for this task, which is to be found in the Tool Shed. 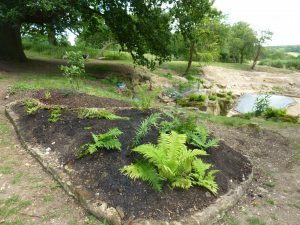 Resume watering the Central Bed and the newly planted ferns and plants in other beds. 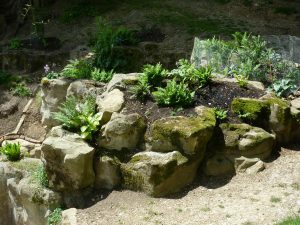 Do Not Water – we are reminded that the well-established ferns on the rockface should NOT be watered because their roots are finding their own source down inside the rockface, which leads to long term strength health and resilience. clear the scrub from around the base of the Wellingtonia tree close to the cattle corral. 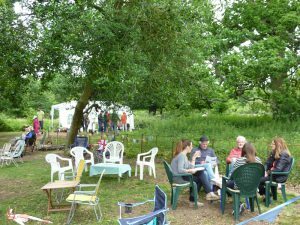 Saws and loppers will be brought to the Fernery Shed where we will all meet as usual.